04/28/2011: JUMPIN' MATH JAM FREE has just been released! 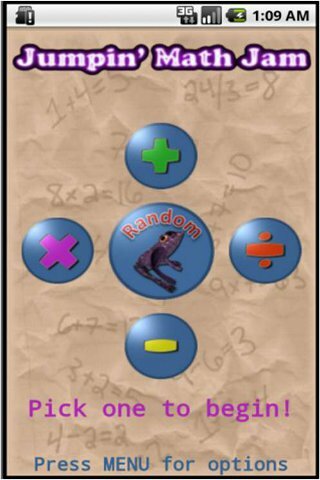 It is a free ad supported trial version of JUMPIN' MATH JAM, but includes only addition and multiplication. Give it a try! 04/12/2011: Get a preview of JUMPIN' MATH JAM on YOUTUBE! You can learn how the game works, discover features, and determine if this app is right for you! 04/09/2011: JUMPIN' MATH JAM USERS: Thank you very much for your positive feedback! v1.1 Has just been released in response to your requests for new features! Check it out on the Android Market! APPTITUDE DEVELOPERS is pleased to announce the launch of its first mobile application for the Android platform, JUMPIN' MATH JAM! 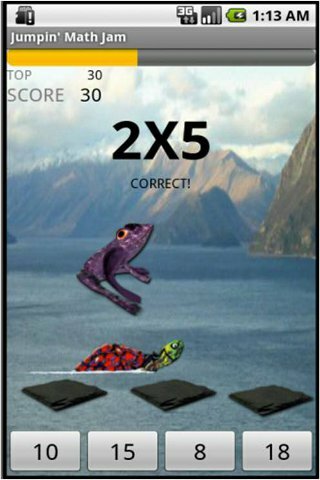 JUMPIN' MATH JAM is a really fun way to practice addition, subtraction, multiplication, and division facts as you (a frog) try to beat the turtle in a race to the next level. It's a fun game that's more entertaining than math flash cards, and can be quite addictive! For 5th graders and older, the "random" mode is recommended as it takes you through all operations up to the 12's tables. For earlier elementary students, focusing on just one operation at a time can help reinforce skills. As you go through the levels, the game moves faster and faster! JUMPIN' MATH JAM can be found in the Android Marketplace. Copyright 2011 Apptitude Developers. All rights reserved.